Listening to Cities is akin to experiencing the literary gloom of Arthur Koestler mixed with the gritty urban world of Frank Miller. Dogged characters in dark municipalities ride a wave of post-rock collusion throughout the ten songs of their self-titled offering from Yep Roc. Guitarists Robbie Mackey and Josh Nowlan, who also covers lead vocals, produce a wash of complimentary hooks, creating a space for abstract narratives to take their dark shape. Confident and occasionally danceable kit work from Joey Ingram guides the unfolding melodies alluding to loss, entrapment, and anxiety. Opener “A Theme” defines itself by its engaging guitar hook while galloping drums drive the command to “fall and then disappear.” Feverish guitars trade complaints over the powerful chorus of “Capitol,” while the spaces in “OOC” give resonance to Nowlan’s vocal range, shaping the dramatic build to climax in the final minute of the song. Both “Writing on the Wall” and “Cons, Thieves, & Murderers” further push the edge of darkness, crescendoing in bursts and serving as staples of straight ahead rock composition. Closer “Barricades & Garrisons” exhorts the listener to revolutionary action before it’s too late, a hope that dashes itself on the riotous dissonance of the song’s final moments. The power of their freshman release has led Cities out of their North Carolina and they have toured throughout the US, including CMJ. Though there was an amicable separation with original bassist Jeremy Paschell a few months ago, Cities has labored on, utilizing Heads Down, Thumbs Up bassist Brian Warren for their most recent tour with avant-noise growlers Cataract Camp. Before a show at The Note in Chicago on this tour, I had a chance to talk to Cities about their emergence into the world of indie rock and their hermeneutically ripe record. Joey Ingram: The band started at the very beginning of 2004. I went to high school with Josh and he was in town for Christmas break. We had talked in the past about starting a project together, so we started working on a couple of songs. We couldn’t find anyone in Greensboro, NC who could fill the slots we wanted. Josh knew Robbie and Jeremy from his time at the University of North Carolina. We all met together at Go! Studios in Chapel Hill originally and paid for practice space there. We got a few songs written and then, because of cost and because it was a long drive for me coming all the way from Greensboro, we moved our practice space to a storage unit in Burlington, NC, which was more of a half-way point for us. We played our first show in May of 2004. Was your first show in Chapel Hill, NC? Joey: We played at several clubs in Chapel Hill and a few in Greensboro. How did you come to call the band Cities? Robbie Mackey: Joey supplied us with a long list of possible names which he thought were suitable. We had been calling ourselves up until that point More In, which was a really crappy name. Josh was really taken by this art nouveau print advertising absinthe called “More In” and no one had any better ideas so we went with it for a bit. Josh Nowlan: Since More In could quickly become Moron, we decided to ditch it and ended up choosing Cities from Joey’s list. It fit because we wanted to do something darker and to consciously write songs that weren’t super happy. What was the story with getting signed to Yep Roc? Robbie: It actually happened through MySpace. 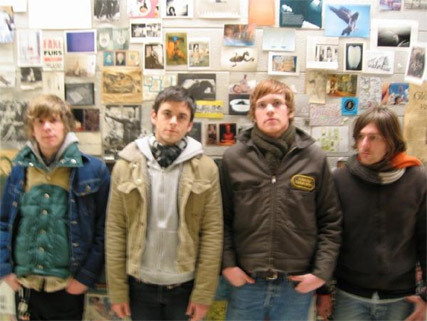 We had our MySpace profile and some songs up for a while and then we got a MySpace message from Yep Roc saying “Hey we like your stuff, we want to come check you out.” We played for them a couple of times and then they wanted to sign us. Do you directly credit MySpace for opening the door there? Robbie: To a certain degree. The Chapel Hill scene is small enough that we would have been noticed sooner or later, though I don’t want to discredit MySpace for helping us out. 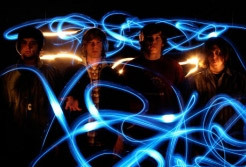 Josh: The songs we had up on the MySpace page were ones we had recorded in Chapel Hill at Go Studios for $250 with Nick Peterson, a producer who has worked with other notable Chapel Hill groups like Belafea and Dillinger Escape Plan. Who do you guys like on Yep Roc? Robbie: Billy Bragg, Bob Mould, the Comas, Kingsbury Manx, Robyn Hitchcock, and American Princes to name a few. It’s a great label. Josh: We’re actually the youngest act they’ve ever signed. So I think they are making an effort to move toward signing more traditional indie rock. The knee-jerk comparison to your sound is to name drop Interpol. How do you guys react to this comparison? Josh: (Laughs) We all like Interpol. Robbie: Yeah, Interpol’s fine. I think, though, that anybody accusing us of ripping them off should maybe listen to the record a little bit more. That said, I can certainly see the parallel. Of course, you can also hear many other influences, mostly late ‘90s, like The Wedding Present or Mineral. The Interpol similarity was kind of an accident really. We wrote “A Theme” and it worked and then when we were done with the record we were like, “Man, there’s a lot of dance-y stuff on here.” It wasn’t really supposed to happen that way at all. Josh: A lot of it really is just four dudes in a room, with these instruments, and the sound is something that worked. It just happened to end up the way it did. Joey: And the vocals, in melody and style, are a lot different than Interpol. To me, the vocal style, and much of the sound, are reminiscent of early Sunny Day Real Estate. Robbie: Yeah. We’ve also got a lot of Muse comparisons, which I just don’t see at all. We’ve also gotten comparisons to The Killers and Editors. Yeah, basically many people hear the disco beat and post-rock sound and immediately go to the big names boxed into that category. What do you think of the UK comparisons, like being referred to as having a “Manchester sound”? Josh: We are all big fans of British music, we all listen to it. Joey: Yeah, but I feel like we are a decidedly American band. Robbie: The thing is, you can’t argue with the comparisons other people make. There’s nothing you can do about it. Those are the songs that we wrote and if you think they sound like UK music, cool. If you actually like the songs, even better. What was it like working with producer Brian Paulson? Josh: He’s got his own home studio, which was really cool. It was really laid back, but it went really well. It was our first record so we ended up learning a lot working with a guy who had such an impressive resume. Sure, Paulson has worked with bands like Beck, Slint, and Superchunk. Josh: Walking in and seeing the gold Odelay record on the wall was pretty impressive. But it was cool, he was a nice guy. It was a pretty straight forward record as you can hear. Most everything, except the vocals, was recorded live and he captured that really well. Could you talk a little bit about the desperate narratives that go on in this record? I’m thinking of “Lakes”, “Headstream”, and “Cons, Thieves, & Murders”, which all seem to allude to darker themes. Josh: I’m the only one who writes lyrics so those are my doing. (Laughs) They’re vaguely narrative based on an image in my head I get for each song. The idea is to keep the interpretation up to the listener. Robbie: One of the guys from Black Heart Procession talks about how they rely on imagery to create a mood, and that borrows from film as well. They love David Lynch and it comes out in their music. They’ll talk about a really grotesque image which may not be connected to anything else in the song, but it really creates a more palpable or tangible experience than a song about, for instance, how much you love a girl. Josh: In songs you have melody and lyrics, and certain notes can be colored by a word in a way that makes the song or a mood the way that you want it. That’s the goal, I guess. There are two songs on the record that have this dark, almost apocalyptic imagery and are both very powerful. “Barricades & Garrisons”, the last song on the record with its repeated refrain of “Beware the end is near,” and then “Writing on the Wall”, which clearly refers to an ominous ending of some sort, are both good examples of the mood setting you’ve been talking about. Since everyone in the band grew up or went to school in the South, has living in the so-called Bible Belt given some of these narratives this apocalyptic urgency? Josh: I mean, sure. (Laughs) “Barricades & Garrisons” does have a pretty clear narrative about being trapped, with anticipation for the end, and then the end comes, and it’s the last song on the record. It has a dissonant edge to it that’s unsettling and that’s something we did on purpose. It seems like this would be the perfect song to close a set with. That’s a great marketing strategy. For this tour, how did you guys get hooked up with Cataract Camp? Robbie: Through MySpace which, again, is such an important tool. They left us a message saying “Hey, listen to us. We want to play a show with you.” And their songs are great. They’ve recorded with Travis Morrison and they’re all really great guys. Josh: They hooked us up with a show in New York, and our relationship kept going, and now we’re here on tour with them. They’ve got a great live show, too. This tour is taking you through the Midwest and all along the West Coast. So what’s the future for the band after the tour? Josh: I think a bunch of us are going to the beach afterwards. And then we have a remix CD coming out in the Fall featuring bands like Ladytron, Daedelus, Mild Davis, Free the Robots, Cacheflow, Isan, and Fog. Each band took a song from our record and remixed it. We even had a competition through Yep Roc for a fan to remix “A Theme” and then we’d place the best version on the remix CD with all the other bands. The guy who won did a great job. Look for that record soon from Yep Roc.